So well put. Exactly what I think and did not know how to phrase it. I think that man is a disgrace and a total conman. The Encloypedia of Palmistry, to me, was an unbelievable joke.Everybody else's ideas and opinions, so if you don't agree with anything in particular don't blame me, I told you who said it, so ask them.With my little knowledge and inexperience even I could write books like that.This Fingerprints and Behaviour is the same and the part I like, although he does not say it, is the findings of these friends he so much admires.He says he is a lawyer and I definitely believe that, for he sure does act like one. God fobid I ever ended up falling foul of the law and he was defending me, I would probably end up on death row. He says what he thinks people want to hear and brings to mind, to me, the saying, never let the truth get in the way of a good story. I am not sure but Lynn had a great radio interview, which I really enjoyed listening to, and the person she spoke to was so nice and came across so well and I think it was Mr. Campbell. If you know how to look things up maybe you can find it and listen for yourself and if I am right and it was him, things are even worse, for I now have another opinion of him he is a Wolf in Sheep's Clothing. Meant to mention I think reason for where he has reached in this field is due to his talent for picking people's brains. I have known about Ed Campbell for about 20 years - he used to write to me and wanted to join the Cheirological Society but as far as I recall, he never did and never did any courses. He sent me a copy of his 'Encyclopaedia' when it came out for review, so I reviewed it. He didn't like what I said !!!! He posted on this forum with a really bad attitude. Jeanette, my radio interview was with Ken Lagerstrom. Ed Campbell was also interviewed by Kenneth on a different week. "those with loops together with a transverse creased between the proximal transverse crease and the wrist that runs from the ulnar edge of the hand to the thenar crease on the right hand , and possibly on the left hand at the same level in the centre of the hand touching the thenar crease, will tend to become physically ill at their stomach when pressed into confrontation or arguments. The location of the print on the right or left hand will aid in determining in what activities in life the expected behaviour will more likely manifest. This will also be influenced by the more currently predominant portion of the brain used to control personal relationships and this in itself can often be determined from the hands through a subsequent, pressure sensitivity test." I understand your association with the Via Lascivia... however, I would assume that if Ed had the Via Lascivia in mind, he probably would have used that name. Therefore I think Ed is refering to a so-called '(transverse) hypothenar crease' (see the picture below: no.8 ) which typically starts at the side of the palm and manifests as a straight line which ends near/at/beyond the life line. Thanks Martijin, but looking back at the topic it is associated with Coffin Lowry syndrome and he is connecting it with a sick in the stomach feeling. Strange interpretation he has come up with. I think you should try to understand this in the perspective of the fact that in the Coffin Lowry syndrome the structure of this line is typically just as strong as the primary lines, while the line described by Ed probably has a normal structure (= not stronger than the other secundary lines). So I would recommend to consider the width (structure) of the line as an essential characteristic! Jeanette, does this make sense for you? Yes, thanks Martijin I understand. The full title of the book is Fingerprints and Behavior, A Text on Fingerprints, Behavior and Dermatoglyphic Behavioral History. So yes, in keeping with the Title, I hope I provided a fair historical background on the subject along with good references. For those who know it all, I regret you spent your money and suggest you stop buying books. I did not provide 30 pages on clocks. I used the clock examples on four pages to illustrate my points. I have never seen this point on degrees of honesty made or illustrated before, but I have not seen everything in the world. Amazon.com allows for a wide selection of contents to be reviewed before purchase: Front Cover | Table of Contents | First Pages | Index | Back Cover. The nature of the book are amply covered in the contents of the book. I don’t understand the criticism of the inclusion of historical and other contents except as a misunderstanding of the nature of the book. The critic wanted something and I wrote something else. Some parts of the book were an introduction to 21st Century areas of observation, such as Mary Lai’s beginning observations on Minutiae and behavioral correspondences. Ridge counting is used in several DMIT approaches as well as other areas of forensic sciences. Many are new and still closely held as proprietary secrets. But the methods and features are not a secret and perhaps with my opening the discussion, they will become subjects for more serious study. I aim to begin to bridge the gaps between behavioral biometrics, dermatoglyphics, forensic sciences and psychology. For those new to the study, at least you will have some guide to the physical conditions of the prints to be aware of and watch for. I had no intention of providing life purposes or other “guidance” in the book. I feel the area is far to young to become a source for anyone’s personal life purpose. I did not write a spiritual bible. Indeed, I professionally doubt that there is such a thing as life purpose, other than survival. I pointed out skills and challenges the individual will be found to have for survival, skills reflected from birth in the form of fingerprints. I believe this is a critical component of giving any advice as to people’s current problems and goals and to any forensic evaluation of subjects. I found discoveries about hand coordination and potentials for sports very enlightening in considering the development, feelings and attitudes of subjects. Christopher Jones and I corresponded for some time. When he first reviewed my Encyclopedia of Palmistry he did not like what I said about his mentor, Terence Dukes, but we corresponded later, after he and Dukes broke up and he was much more cordial. I don’t recall ever asking to join the Cheirological Society, and seem to recall that he left it when he and Terence Dukes split and he asked me to research some North American (Spokane Washington) connections of Dukes and Dukes claims of academic standing. I have repeatedly invited him to the IBMBS conferences but he has declined. I consider him a good palmist. Jeanette: Line number 8 in the illustration is the line I am referring to in this piece quoted by Jeanette I hesitate to call it the Via Lascivia as there is considerable disagreement as to the actual location and direction of that line. For example, as I recall, Robin Gile describes it more as what others would consider to be multiple girdles of Venus. For me when found on the right hand it indicates a chronic weakness in the liver, and on the left hand it is related to the pancreas. The liver is closely related to emotions, as one may recall of the deep vertical furrows between the eyes indicating anger and liver issues. 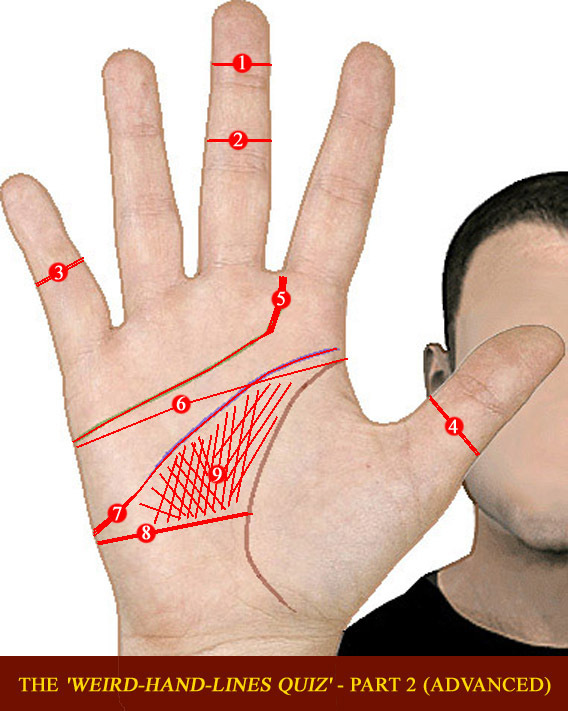 For those unfamiliar with anatomical terminology, the proximal transverse crease is generally considered the head line in palmistry. When line No. 8 reaches the life line, I frequently find digestive issues, pancreatic on the left and perhaps liver enzymes involved on the right. It there is another horizontal line under No. 8 on the right look for gall stones and gall bladder issues. If the lines are not discolored, then it may be more potential than any actual current problem and could be possibly be controlled by diet. When I wrote this I was more heavily influenced by current thoughts on left and right brain and ideas that certain sides of the brains might control personal issues. I have now moved away from that to a more cautious stance. Let us do research and see. The brain is very tricky to try to understand at this stage of our knowledge. I have seen ir reported that 70% of left handers are left brain dominent which confounds my old anatomy texts that say we are cross wired. Also, when speaking of brain dominance, it usually reflect not hand dominance but speech dominance. So I would now urge caution and further research in this area of speculation. Jeanette: Thank you very much for your other kind comments. Please post them in the review section of my book on Amazon.com. I need all the good publicity I can get, if any bookstores are ever to carry this work. My own local East West new age book store has ignored me for years, perhaps because I do not have one of these current popular certifications. It has started to use one as a regular reader who studied one of the current systems of life purpose identification and did not want to be confused by my work. Martjin; Thank you for your thoughtful and kind words. Over all, the work has something for seasoned palmists to test, and something for those interested in the field to have as background for reference in the area, and something for the potential researchers to ponder. I received my copy yesterday. I have to agree with Jeanette and you here, at first glance it is an odd book. Text so huge on many pages only a few words fit. As in one sentence per page! Many of the images have been enlarged so that the fingerprint images are unbelievably (unreadably) pixelated. Remember trying to trace Disney's fingerprint!? Many of these would be impossible to trace - and the subject is dermatoglyphics! As already mentioned a large part of the work is from other's books. I was surprised to see what appeared to be actual copies of pages from Unger's and Hirsch's books. Well that's judging a book by it's cover and general appearance. I'll let you know more about it after I've actually read the book. As already said the first large part of the book is a collection of what just about every palmist, you could name that is published, opinions on what the fingerprints mean. Then there is a large amount of information shared from his website on fingerprint development and their history. I had to chuckle a couple of times to see Ed's published disagreements with Martijn. Unfortunately, in the book, Martijn doesn't get a chance to present his differences in opinion as here on the forum. Also as already mentioned there is some new information, never before presented, relating to loops and honesty. There is also a section where Ed gives a meaning for each type of fingerprint on each finger. I was surprised to find a meaning for a tented arch on the little finger. Cummins & Midlo found zero on the right hands of 5,000 people and .02 on the left. Of all the palmistry books I have in my collection, this one is the least well written. It comes across like a collection of mismatched information all thrown together. Ed suggests that professionals of all types will find the book useful. But, the beginning chapters with a mix of other people's views is not helpful as the different authors are not in agreement with each other. Ed offers his own viewpoints as well but doesn't compare or point out any discrepancies between what he writes and what other authors have written. Holtzman's work is mentioned a few times but in the footnotes there is discussion that he lacks the credentials needed to make the claims he's made. I am surprised at the free use of work from other books with no notes of permission at the beginning of the book. Ed, I assume you will read this and I sincerely had second thoughts about writing anything about it as I'm not one to want to offend anyone. But, this book feels like it was rushed to press without even being proof read. There are many typos and spelling errors throughout. There were a few pages that I did look forward to reading. That was where you listed a number of things that you had come across such as the whorls on the thumbs. You have always shared a tid bit here and there that is unique and I was hoping for a lot more of these to test out in my readings. Thank you for including pages of God Given Glyphs inside your new book Fingerprints and Behaviour. I was happy to share and readily gave you permission to include my illustrations. I am grateful to you for being a mouthpiece. You have via your book increased awareness about the existence of 5 element chirology … and of God Given Glyphs. As you mentioned in your email asking if you could use my illy's - “this would be more advertisement for your work.” You certainly are and have been a wonderful ambassador for me and many other hand readers globally. While it is true that you correlate the work of others and that you offer little that is original, your unique brand of contribution to hand reading, your personal style of delivery, has its own creativity, along with, in this era, somewhat monumental significance. I see you as our most valued grand-gatherer, a mouthpiece, an agent and a networker for the who’s who of hand readers. Kudo’s and credits go to you for your passion for hand reading research, so indisputably evidenced in your hard working perseverance and efforts, not least of all with the organisation of the International Behavioral and Medical Biometrics Society Conferences. You, your contributions, as well as your lawyer status, have brought endorsement and given greater credibility to the hand reading craft. It saddens me to speak my truth herewith about the content of the book itself. I know well how deeply criticism cuts. This being said, I feel obliged to report that in my opinion the printing standard of Fingerprints and Behaviour is appallingly shoddy. Some of the glyph illustrations are completely illegible. From page 156 it goes haywire, different fonts then bizarrely large fonts. The editing, or lack of (loads of spelling mistakes, extra full stops etc) defies comprehension. CreateSpace offer editing and preview to publishing options. If you proofed after you uploaded and the inexcusable mess-up is theirs, why not halt sales until they rectify? Surely they/you have a quality standard and don’t want the reputation of producing such a sloppy quality book? With regard to the look and feel, my feelings include disappointment, anger and shame. Out of respect to your customers and to those of us who are represented in your book, I’d have hoped for a more authentic, heartfelt apology, instead of defensively blaming CreateSpace for the ‘binding’ (even though it is more specifically the printing that is so embarrassingly bad). I find that all mention of inter-personal relationships annoyingly distract from the value of the book. I am disappointed by the inclusion of the hanging out of your washing. Your opinions of and conflagrations with other hand analysts are documented online and have no significant relevance to the topic of this book. The book is a quick read, somewhat disjointed and repetitive, but with useful references for the newcomer. On the plus side, I enjoyed learning about a new way to perceive loops, your ‘clock’ and types of honesty theory certainly brings a new dimension to explore. Well done in terms of achieving your objective - to ‘bridge the gaps between behavioral biometrics, dermatoglyphics, forensic sciences and psychology’. Thank you for sharing how you approached a rarely seen fingerprint pattern. Your style is more what would be expected in that it acknowledges the rareness and describes your approach to understanding its effect. I found the personal asides in the book awkward, especially since I've had conversations with a few of the people, at least here on the internet. As I began reading it I was wishing I had a book already published so I could be included, but by the time I finished reading it I was relieved not to be included or mentioned. Although I joked a little about the comments in regards to Martijn, at the same time I thought they were unfair without Martijn having an opportunity to respond. When I saw your new work included with pages literally copied I was surprised and looked for the permission that is usually shown in the first pages of the book. Most publishing houses (unless self-published) include a statement about requesting permission from the publisher not just the author. For instance Ronelle's book is published by Llewellyn and states at the front permission is needed from the publisher to reprint. Most people who have gotten permission have a statement in the front of their book that shows permission granted. The author in that case doesn't have the sole right to give permission. Guess it's a good thing Ed is also a lawyer. Personally, I don't think little gems from your pages should have been taken out of the context you placed them in and shared in rough quality. With regard to the look and feel, my feelings include disappointment, anger and shame. I've not met you personally but in the more than ten years I've interacted with you on the internet I have only seen you show this kind of emotion when great harm is being brought upon Mother Earth or it's people. For you to speak out like this tells me how deeply hurt you are by this. I applaude you for speaking up, I know what it takes to do that. I sincerely appreciate your reply and input as well as your support for my having 'spoken up'. Thank goodness for your input to my post. After I'd read the book, it took time and soul searching to decide whether or not to post an open letter to Ed. Martijn I am grateful to you for providing this forum that I may say my piece as well as for your astonishingly committed efforts to collate everything to do with hands. You do what Ed did, and then some. Just to clarify, I am independently published and I gave Ed the go ahead to use my material. Thank you, well spoken. I am especially glad to see your thoughts & perceptions about your materials in Ed's book here at the forum. I have not spend enough time reading Ed's book to find the passages where he mentioned my name. In which chapter (pages?) did he make the report about our discussion? I don't know on which page numbers you are mentioned. It was the general overall feel of Ed's references to other hand analysts that I was referring to. I had to chuckle a couple of times to see Ed's published disagreements with Martijn. Unfortunately, in the book, Martijn doesn't get a chance to present his differences in opinion as here on the forum. " Ok Jennifer, thank you for explaining. One mention is on page 100, there's another somewhere that also gives a brief background as to who you are. I just happened to bend the corner to this page. "I do not share the view of Mr. Martin Van Mensvoort that the whole DMIT is a sham, a fraud. I would suggest his objections be viewed like the erly (sic) controversies over the Kaufmann Assessment Battery for Children which stirred great controversy when introduced, especially regarding he (sic) validity of K-ABC theory that may still be unresolved. Never-the-less it is still widely used in the West." I am surprised that you praised this book as one of the best of its kind (perhaps it stands alone in a category ) when you really hadn't read it. How did you ever read the book and not see your full name in print, twice, or the way he even referred to Arnold Holtzman before giving your seal of approval? Well, though I have shared my views on the comments of others describing DMIT as a sham... I have not described it myself as a clear example of fraud, nor a sham. Here at the forum (and in some facebook discussions) I have described my observations regarding the claims that are made by DIMT (and the related products, though the people involved denied that there are connections... which sort of illustrates the situation that the people involved somehow all belief that they have invented the wheel, etc). But I understand why others have described it as a sham or fraud. Because from my point of view DMIT can easily be recognized & classified as pseudoscience (but this requires some detailed knowledge about that they talk about in the profiling). And we have seen that in some countries for the same reasons that I described it has been forbidden (locally, not nationwide) - basically because the tools presented to usually young parents have never been validated with scientific standards (which always requires some public sharing, etc.). Will your book "God given Glyphs" become available through an international publisher? I certainly hope so Boaz! Thanks for your interest.... I've submitted to several publishers so far, only to be informed the God Given Glyphs is 'too niche'. Hoping to find a publisher who is able to see the bigger picture, i.e. how quickly 'niche' becomes 'mainstream' e.g. astology. I look forward to eventually announcing that GGG is available via Amazon.Publishing with CreateSpace or other P.O.D. company is an option but as a South African we need a USA TIN (tax identification number) and IRS clearance. That process is underway but right now I'm a little wary of going the CreateSpace or Lightening Source route now that I have seen their poor quality of publishing i.e. Ed's book. Dreaming of someone to see the promise of GGG and to hold my hand, to help me to get it out there. One thing writing a book, then comes the marketing and distribution - time consuming and administrative tasks that I'm not terribly good at. Appreciate your asking and the space here to share. Wishing you best of luck! I am not familiar with the publication process but hopefully someone here may have an advice for you. It does sound like you are doing the right thing making sure the publication is of good quality.